Property with house and gite on 4 hectares of woods. The Lot-et-Garonne is located in south-western France, beneath the Dordogne. It is divided into two distinct geographical areas thanks to the Garonne River, which flows through the department from the south-east to the north-west. To the right of the river, the landscape is characterized by deep ravines and rolling hills. Much of the land on the left hand side is a continuation of the plateau of Lannemezan and Armagnac. The east of the department is also home to a high altitude, forested region. 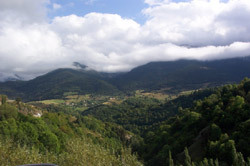 On the edge of the forested area you will find Bastide country. Nicknamed the Tuscany of France, this area is rich in fortified towns and impressive castles which at one point in time were on the frontline during the Hundred Years War. One of the most impressive is the hilltop castle of Monflaquin. where the panorama is appreciated by walkers and picnic goers. Monpazier is considered to be the most perfectly constructed and best preserved of all the Bastides. However, the Chateau de Bonaguil is certainly the most photographed castle. The exterior has the impression of a Hollywood set. The interior, however, is in poor condition. 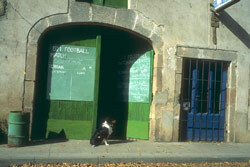 Agen, the department's capital has prospered from its location between Bordeaux and Toulouse. Occupying four 16th and 17th century buildings, the Musée Municipal des Beaux Arts is recognised as being one of the top provincial art museums in the country. Nerac, just to the west of Agen has just 7,000 inhabitants. It is home to many fine monuments which dominate the town's public areas. This is due to the town's past connections with the house of Albret. Just to the south you'll find the town of Mezin, surrounded by quaint countryside. This is a great place to pick up homemade delicacies such as foie gras, armagnac and 'Floc de Gascogne' a wine proudly produced almost exclusively by women. The nearest international airports are Bergerac, Bordeaux and Toulouse, with a range of flights direct from the UK supplied by a variety of airlines. The super fast TGV train service is also an option. It takes just 3 hours and 25 minutes to get from Paris to Bordeaux. Whilst prices in the rest of Aquitaine have risen steeply in recent years, the Lot-et-Garonne has always been an expensive department as it is strategically positioned between Bordeaux and Toulouse. You are unlikely to find many renovation properties here. Do you know Lot-et-Garonne better than we do? Do you have photos of Lot-et-Garonne? The Lot-et-Garonne is situated in the east of Aquitaine in southern France.